Do you have a hard time motivating kids to do chores and help with cleaning house? Perhaps you’ve tried chore charts, allowances, or other incentives to motivate kids to do chores, but it still feels like you are nagging the kids about their chores each week. Kids chores do not have to be boring or feel like a punishment. There is a simple and wonderfully beneficial way to get kids to do chores happily, without the argument, the nagging, or the power struggle. 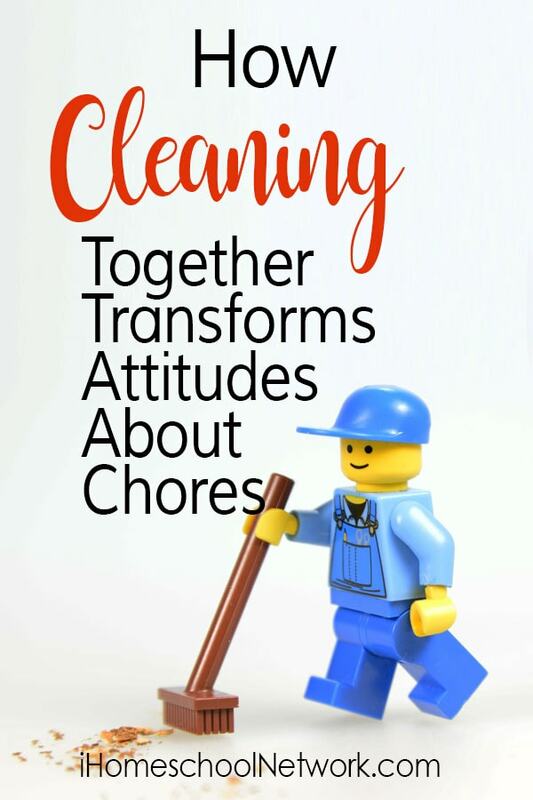 How can you get kids to do chores willingly and even have a good attitude about helping? Take a look at what you are asking of your kids. Do you require them to do certain chores alone? To do them in a certain amount of time and do them well? I remember chore lists and chore schedules as a child. To go clean my room or a bathroom felt like solitary confinement and punishment. I never felt like I was being a helpful part of my family and I certainly was never happy to do them even if I received an allowance. When my kids were old enough to help, I would let them even if it took longer and meant I would need to go over what they had done again later, if I wanted it truly clean. My philosophy is to never refuse help. When young kids want to help, find a way to involve them so you don’t discourage them for wanting to help you. Young kids always want to be involved and help in any way they can. Let them help to the best of their ability, but don’t nag them about doing it “right”. That will come with time. As they get older, more is expected of them, and they may lose that desire to want to help. Especially if they are now expected to go clean by themselves or are constantly being critiqued. What if chores were not solitary? Your toddler wants to be with you, spend time with you, work together while you wipe counters or fold laundry. Your older child still wants that time with you! In our family, we have a chore day, when we do all the major household chores for the week. Rather than having a chart where everyone is expected to take care of their own responsibilities, we work together as a family. First we each gather and sort laundry to get that started. Then we pick up anything on the floors and around the house together. We do this each evening as well, so this never takes long. It doesn’t matter whom it belongs to, we all clear the clutter and make piles at the foot of our stairs, one for each kid and they can then take their things up to their rooms and put them away. At first the kids would only take their own things, but now they realize we can all get done faster if we help each other. So, they often help carry things for each other. I help carry things up to their rooms as well. I try to be an example of helping and sometimes I’ll remind them that, though it’s not mine, I’m happy to help; we all help each other in a family. Once the floors are all picked up, we do alternate between mopping and vacuuming as those really are one person jobs. I let the kids sort out on their own who will do which task, but, we are all working in the house at the same time. Crank up the music and have fun with it! Dance with the broom or chase a kid around the living room with the vacuum. Having a playful attitude yourself will rub off on your kids and make it enjoyable for everyone. I start laundry while the kids sweep, mop, and vacuum. Once those things are done, we do bathrooms together. There’s not a lot of space, but it’s so much more fun to work together! So, we squeeze in and alternate between who does the shower, the toilet, and the sink. We check each others work and if we see something that was missed, we clean it or offer a friendly suggestion, no nagging allowed. I will ask them to do it over again if they rushed through too fast and obviously did not do a good job the first time. They have learned to pay closer attention so they don’t have to re-do their work, especially since re-doing it might require them to work alone after everyone else is done. Dusting has become a game. We have a couple dusters, so the kids run around the house and see who can get the most rooms done the fastest. They know they have to do a good job or do it again, though, so they can’t go too fast. Having a set schedule really helps to motivate all of us. We don’t feel like we are cleaning all week long with one chore day each week and the kids know that on that day, not to expect to do anything else until those chores are done. We do pick up after ourselves throughout the week, but deep cleaning is saved for chore day. Why Should I Clean My Child’s Bedroom? Cleaning together extends to your kids’ rooms as well. There are so many benefits of spending this time together and modeling a helpful attitude to your child. Shouldn’t kids be responsible for their own messes? Yes, I agree with that, but I also know how overwhelming and daunting a task cleaning a big mess can seem. We live in an age of too much stuff, which causes anxiety and kids, no matter what age, need help learning where to begin and how to organize. I urge you to help kids purge their toys and live minimally, but no matter what, a kids’ room will get messy. I encourage my kids to pick up after themselves on a daily basis; put laundry away, dirty clothes in their hampers, toys put away before others are taken out, and off the floor so I can always get to their beds at night to give them kisses and hugs. Like any kids, their rooms will eventually get out of hand. So, about once a month I will spend some time helping each one clean their room. We purge old toys and clothes, throw away broken toys or garbage, and sort through everything that needs it together. We might even go through the closet and organize the clothes in the dresser. My kids have learned that if they don’t want this to be a huge, time consuming job, that it’s often better to pick up after themselves each day and not let it get so messy. It’s always difficult to know where to start, so I suggest focusing on one type of item at a time. I always start with clothes. We talk and laugh together while my child sorts clothes into clean or dirty. I help fold and hang clothes as needed. As long as my child is working hard, I stay and we enjoy the time spent together. I try to keep it fun and light, offer suggestions, but let my child decide how and where to keep things. If he slows down, or stops altogether (it is easy to get distracted), I remind him to continue with the task at hand. If he continues to mess around and is not cleaning, I warn him that I’ll go out if he’d rather do the work alone. I will not clean his room for him, I only offer to help as long as he is working, too. My kids and I both have really come to enjoy this time. They always feel a huge sense of accomplishment when we are finished and they love the space their newly clean room offers for play. Even teens benefit from cleaning bedrooms together. My teen foster daughter and I would have some wonderful talks we may otherwise never have had when we’d sit on the floor and sort through her stuff together. She had an especially hard time organizing at first and I think this helped her learn organization skills that carried through to her school work and other aspects of her life. We would play music and talk and laugh. Though she never wanted to start cleaning, she felt so much happier, less stressed, and accomplished after cleaning up her room. Later she told me she couldn’t believe I would take the time to do that with her. It really showed my love for her in a tangible way. It was a great bonding time. If you have a teen, you know time together can be hard to come by as they have their own schedules and agendas. Cleaning together as a family is so beneficial to the health of your home, for growing healthy relationships, and raising caring, helpful children, Together we wash dishes, do yard work, cook, put away groceries and more. We do as many activities that might otherwise feel like mundane chores together as a family. We each have learned to offer help before help is asked and go above and beyond for each other because we each know what a great feeling it is when someone goes out of their way to help you. Working together has created tighter bonds and more cheerful, giving, and playful attitudes in our home.